First Friday (August 7th) Art Walk. Wine is liquid art. The arts and unique businesses are alive in Downtown Spokane and First Friday will showcase them on a monthly basis on the First Friday of every month. Enjoy an evening of drawings, paintings, prints, sculpture, ceramics, photography and other visual art. Take in diverse live performances, including music, dance and theatre and don't forget the exceptional shopping and dining Downtown has to offer. First Friday Listings - August 7, 2009 Venues open 5-8pm unless otherwise noted. Barrister Winery, 1213 W. Railroad Ave., “After a Long Interruption” by Spokane artist, Dennis Strasser. Twenty years ago Dennis changed focus became the art director for a clothing company. This show signals his return to fine art; his rediscovery. Reception, 5pm, Lyle Morse plays acoustic Blues, 7-10pm, bistro picnic fare from Beacon Hill available for purchase. French Quarter, 1311 W. Sprague, Hosting Airfield Estates of Prosser, Wa! Winemaker, Marcus, will pour some winery favorites –guests can meet him and ask wine questions. Brad Keeler plays exceptional Blues, come sample the latest chocolates. Whitestone Winery, 111 S. Cedar, Proud to host Julie Suchanek, a local artist with a detailed technique manipulating color and shape to suggest the language of each piece, her art is best described as intimate realism. Meet the artist, 5:30-8:30pm. Heather O'brien of 6' Foot Swing provides music. Wine by the glass and gourmet cheese plates will be available for purchase. Grande Rhonde Cellars, 906 W. 2nd (across from the Steam Plant), Featuring Cheri O'Brien. Cheri's paintings often fuse the real and imaginary "things" her mind conjures up when she sees objects, people, and landscapes. Besides twisted and colorful conventional painting she also does glass enamel paintings and fused painted stain glass. She paints images of the Pacific Northwest including the Palouse region. She also chosen to do a Washington State Public Arts commission, a 44 foot fused painted glass scene called "Setting the Fish Free." She will bring a lot of life to the Spokane art scene. Arbor Crest Tasting Room, 808 W. Main, River Park Square, Third Level, Featuring artist Dave McGranaghan, with music by Maxie Ray Mills. Lone Canary Winery, 109 S. Scott Street, Suite B2, Pam Galloway’s exhibit features human and wildlife images, as well as painted furniture. Mellad Abeid on classical guitar, 5-9pm. 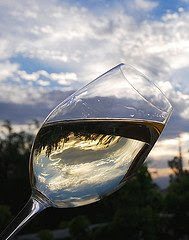 Wine served by the glass with light hors d’oeuvres; BirdWatchers wine club members receive 10% off glass pours.